Welcome to my day of the RUFFLES Blog Hop. I'm not really a RUFFLES kind of girl. I rarely wear them, don't really have many in my home so what am I doing here? Living vicariously through them I guess. For some reason I'm attracted to RUFFLES. I made plenty of things with RUFFLES when this baby was a little girl but that was a long time ago. I even made "country" curtains back in the 80's for the two large picture windows in my living room but again that was a long time ago. So now what was I going to make this time? My RUFFLER attachment for my sewing machine became my new best friend. I had to dust it off since my youngest baby who turned 18 on 2/29 2/28 (yes, he's a leap year baby) sure isn't the RUFFLING kind of guy! After I signed up for the RUFFLES Hop, I was out in the garage cleaning and ran across this old tent. Remember that baby that turned 18? He used to play many hours in this tent I made for him. I almost threw it out as it obviously has seen better days. And then it occurred to me. Hey, I could re-vamp that tent for the grands. The girls would love to play in it and it could have ruffles this time. So RUFFLES it is! Isn't that a major improvement!? Even the "buttons" that have velcro behind them to keep the tent closed is ruffled. Then I thought since I'm the Quilting Queen, they need a quilt to put in the bottom, with RUFFLES of course! So I started out with a jelly roll, thinking the quilt would only be a small lap size. However, the quilt grew, and grew, and now it's a generous twin size and it's too big for the tent. I have a new respect for those who quilt their quilts on a domestic machine. My neck, shoulders, arms, and back hurt just from wrestling a walrus quilt to sew those RUFFLES on and they weren't even in the middle of the quilt. They were along the edge. You girls who do that have some pecks on your arms! I'm naming this quilt "Ruffilicious". Many, many thanks for our fearless leader Mdm Samm at Sew We Quilt for organizing this RUFFLES Blog Hop and to our awesome cheerleader Amy at Sew Incredibility Crazy for all those encouraging words and keeping us on track. Also a huge thank you to our sponsors for their generosity. And last but not least for the participants in the hop that create and inspire us. Hop on over and see what they RUFFLED up. Oh and since you made it all the way through this long RUFFLED post, I have a giveaway. 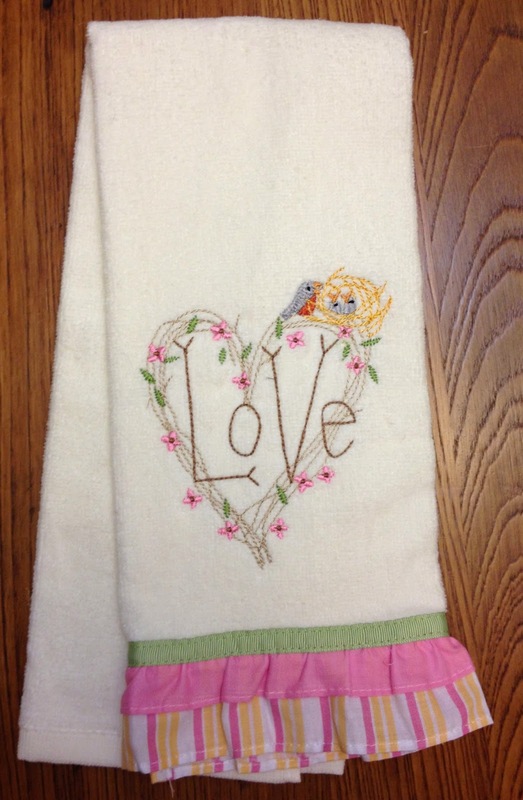 It's a cute RUFFLED trim kitchen towel. I didn't RUFFLE it, I ran out of time, my knee slowed me down, and the price was right. Just leave me a comment and tell me what you have RUFFLED (or want to RUFFLE). For additional chances, follow my blog, follow me on Twitter and re-tweet on Twitter, follow me on Facebook, and/or share this post on Facebook. You now have 5 chances for a win. The giveaway is open to anyone, I'll ship internationally. Now go get all RUFFLED up! What great projects! That tent is wonderful and your quilt is just beautiful. Love that ruffled label. Neat idea! Now you can be called the repurposed Queen, the tent is fantastic! Your quilt will be wonderful to wrap up in. Thank you for sharing. I follow, of course. Love your blog. I have ruffled a peacock and the pasture under a cow (see the second day of the blog hop). Great projects - I love the tent! I'm making a baby dress at the moment for my niece - maybe I'll add some ruffles! I love the tent. Made a teepee for the kids I took care of -- ended up much bigger and taller than I intended. Nothing fancy about it, tho. Just multicolored stripes of rip stop nylon because the fabric wasn't wide enough alone. A friend made a card table house cover for her little girl, "planted" grass and flower beds around each side (up the walls, actually). What I really love is your "floor" quilt, however, although I wouldn't let it touch my floors. 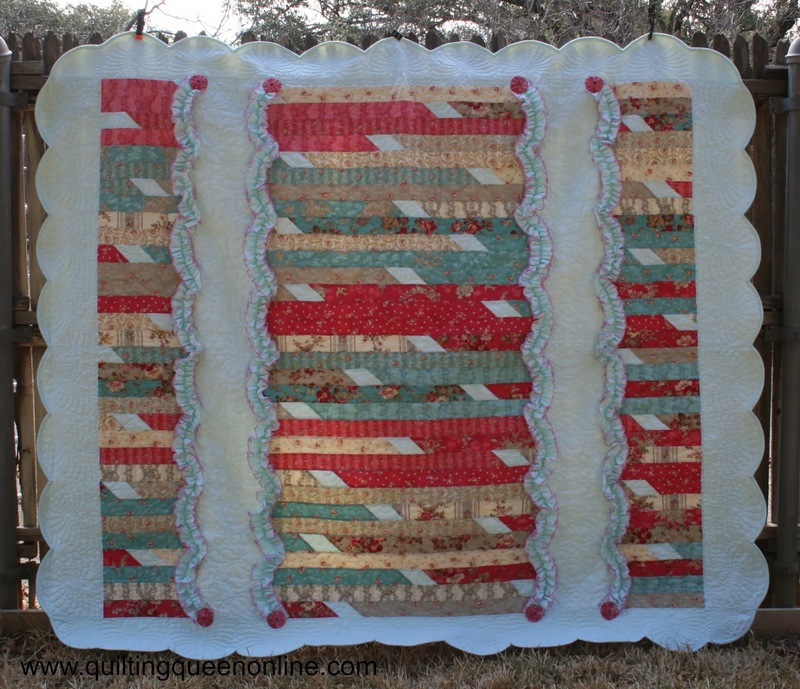 Clever use of the ruffles to contrast the straight strips, and the quilting is absolutely gorgeous. And the ruffled label . . . Since it's too big for the tent, have you now inadvertantly committed yourself to making a similar quilt for each grandchild? How many do you have? Haven't ruffled anything for years. Not since I was sewing for a trio of little girls all about the same age -- two nieces and the little girl I took care of. Biggest project was the year I made three 3-year old Tinkerbells (yards of ruffled tulle and satin) and one 2-year old Captain Hook costume for Halloween. Even Captain Hook got ruffles if you stretch your imagination to include squashed (ruffled ! ) aluminum foil for his hook and ruffling (wrinkling and pleating and plain old forcing) polyester felt into the shape of a pirate hat. Lots of gold braid and ribbon covered up some of the mess. OMG the tent is the cutest ever!! The grands are gonna love it and the quilt floor!!!! Beautiful job redoing that teepee!! And gorgeous quilt too. Great job. Your grandchildren are going to LOVE you to pieces! and their quilt for the bottom is out of sight! Hope you make top 2! I haven't ruffled anything except maybe someone's feathers!! But seriously, if I tried it, I would choose the pleated ruffle on something like a pillow or tably runner. Thanks for sharing this fun post, I especially like the tent and would have loved one as a child. I haven't tried ruffling yet but have been inspired to try, it doesn't look as hard as i thought it would be. Thank you for a lovely giveaway. I already follow with GFC. The tent turned out great, your grand daughters are going to love it! I love ruffles, I made a ruffle rose for a bag recently, and I am going to make ruffled curtains for my kitchen also. your tent is awesome! I love how you transformed it. And the quilt is gorgeous. Love your quilting!! Loving your projects, the grands will love them! So many beautiful projects! Love the tent and the quilt is gorgeous. Thank you for sharing. that tent is the cutest thing ever. i am sure the girls will have many hours of fun playing in it. Fantastic quilt. the only thing i have ever made ruffles for is pillows many years ago. A tent! What a great idea! Your grands will love that for sure!!! Love the quilt floor, too! I have ruffled doll clothes most recently, but after raising three sons and having only one granddaughter, I haven't done a lot! STUPENDOUS. Completely amazing. No wonder you got the WOW. Love the towel and all the ruffles. I loved the quilt of course, but your sew right...I do love the tee-pee ! You knocked it out of the ball park yet again my friend ! Your ruffled tent is adorable, and I love your quilt. You really did get into the ruffles! Love it. What fun. I ruffled bandanna fabric to a blue jean bedspread one time......talk about hard to handle....just the weight of the spread was a challenge! 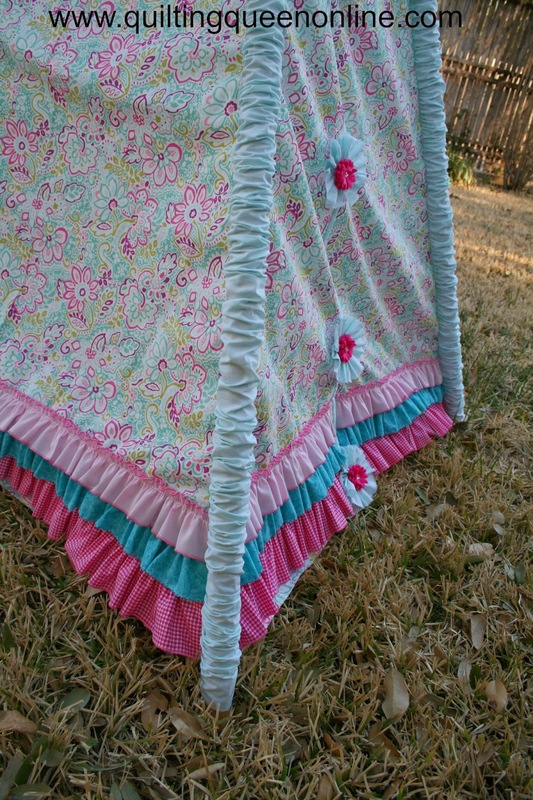 I do like you ruffled quilt and the tent for the grands! I love your ruffled tent...what talent!! And the quilt is gorgeous!! My grandson that turns 21 this summer loved the handprint quilt (with ruffles) I made him as a baby. Now I have been making his baby girl a quilt and had to put ruffles on it more for him than her.. Love ruffles!! 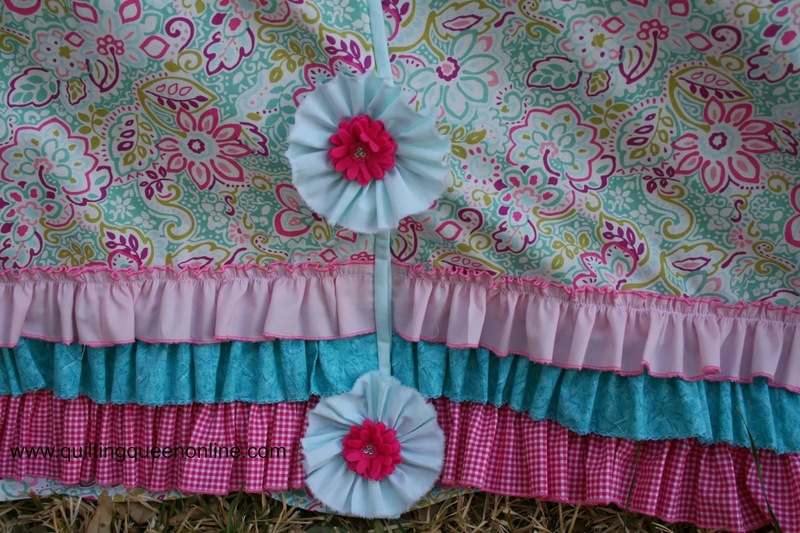 Your tent is adorable..I love all the ruffles and how you added the buttons, how creative! I also like your quilt very much. All the way to the label...gorgeous! Love how you repurposed your son's tent for your granddaughters…so cute!! !…and that quilt is just beautiful!! I've done a couple of ruffled pillows and some flowers but plan on doing more…especially after all the inspiration from this fun hop!!! I bow to The Queen of Quilting. This quilt is gorgeous!!! I love you sweet little ruffled TeePee. Just adorable. Your granddaughters are going to love playing in that. That quilt is definitely Rufflicious! Beautiful! For someone that does not like ruffles you sure went the extra mile. The tent is cute, but the quilt is ( I had to keep peeking at it to come up with an appropriate word to describe it) really scrumptious. My boys had a tent like this too! What a marvelous way to spice it up for those little girls! 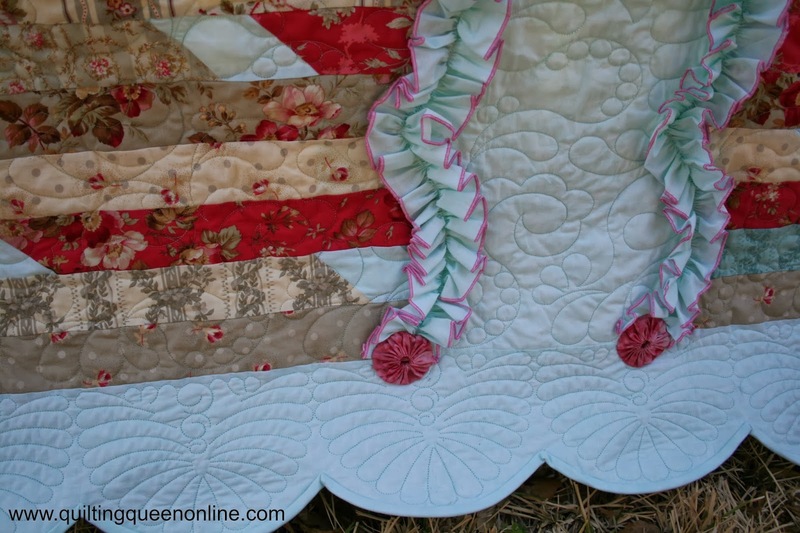 LOVE the ruffled quilt..... it's such a feminine touch! The tent is just amazing. I think you have started something here. Tents are always for the boys. But this one is outstanding. Great upcycling. The quilt is a beauty. I adore your new tent and the ruffles couldn't be better! Ruffilicious is spectacular! I love the double ruffles, the finished edges, the way you scallopped the ruffles onto the quilt, the yoyos and the ruffled label. It's a winner!! I love the upcylcing (can you call it that) of the tent. And it is definitely girly now. The quilt is fabulous. 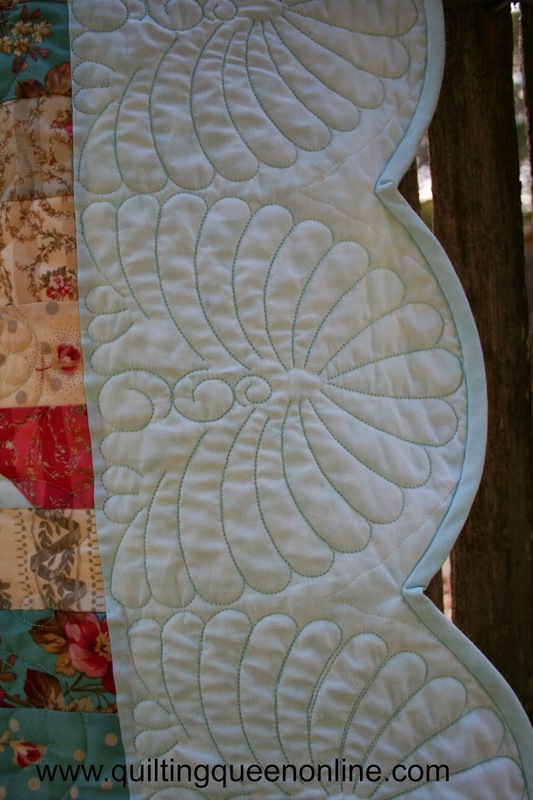 I haven't quilted anything bigger than a table runner on my home machine (my skills are very limited). You did a wonderful job of quilting, too! Some grands should be very happy! When my daughter started kindergarten (years ago - she's 34 now), I made a wardrobe for her. She had dresses in different colors and styles.. She had a sailor dress, a dress with a ruffles at the bottom of the sleeves, dress with bows. I was working a monster full-time job and I sewed and sewed that summer. It's a fun memory. Thanks for participating and sharing a great project. Oooops, I forgot to tell you my ruffley project. 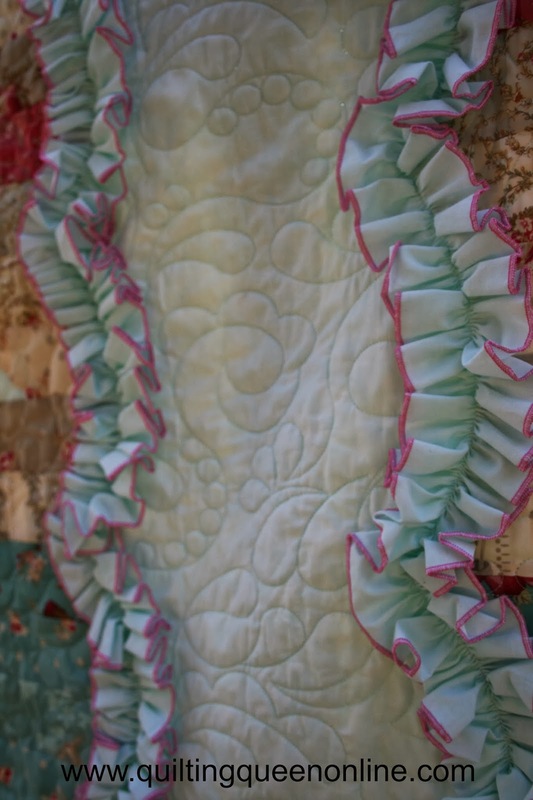 I made a ruffled bed skirt a few years ago. I ruffled it onto an old fitted sheet and added eyelet ruffled trim. Wow! Was I tired of ruffles by the time that project was finished!! Wow! I am so impressed with all of your wonderful ruffled projects. That tent is just perfect for the girls. They will just love it. You did a wonderful job. And tthe quilt, its beautiful. Well done. LOVE the Tent! Soooo cool!! Have a lil Grangirlie that would be delighted!! (Soo...wanna Ruffle a Tent!! lol) I have Ruffled the bottoms of a few lil dresses for prementionws Grangirlie too. Your Quilt is AWESOME too!!! Gorgeous!!! The tent is wonderful. I want to make one for my daughter now! Great idea to ruffle the tent. I would love to make one for my granddaughter. I have ruffled some pillows and hope to ruffle some dresses some day. 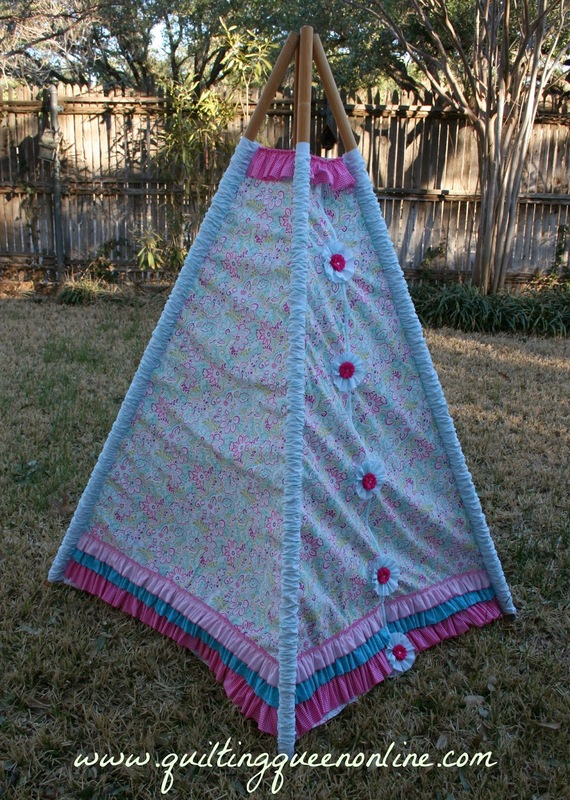 The teepee with ruffles would please any little girl! Great job on the ruffly quilt too! Wish I had a teepee like that when I was a kid. We always used blankets to make a tent over a clothesline. LOL Absolutely love your tent and your quilt! I could definitely spend some time in that tent stitching up a storm! That is so adorable. So creative. I love the ruffled label too! Thank you for the inspiration. Oh the girls are going to have so much fun! The tent and quilt are amazing!!! You really outdid yourself on the ruffles! These are all such great ideas! well hot dang, that tent is just to die for.... So Amazing and the quilt is just as beautiful... I wish I were that creative. Great job!! Your ruffled projects are so cute. I made myself a ruffled purse.